Grab a box of popcorn and your favorite drink and have a seat Terminator fans! It’s time to watch the entire 45 minute announcement in its entirety! Enjoy! 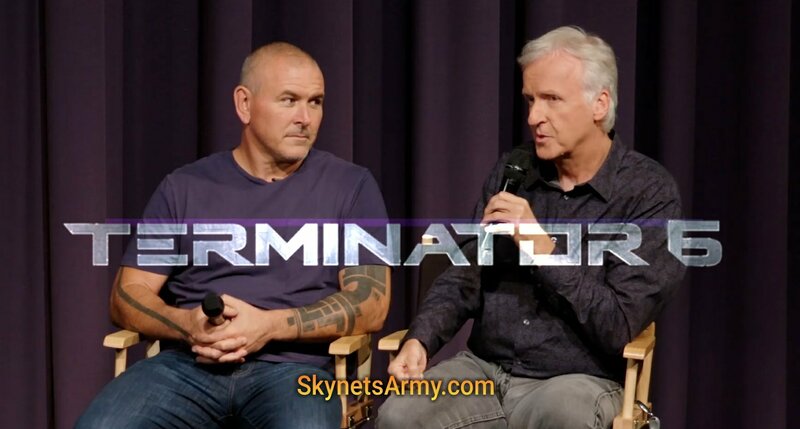 Previous Post“TERMINATOR 6” Official Release Date is Announced: JULY 26, 2019!Next PostIntroducing our New SKYNET’S ARMY Official Podcast! Glad I was one of the 200 people who went to see him! Reveal how timeline being IN FACT UNCHANGED after Cyberdyne sabotage (similar to Cybernetic Dawn comic), and lead to early future war in T3-equivalent entry. The Future War movie we waited in which builing up cross-chronological strategies, possibilities of tactical chrono-deployment DESIGNATED to break the time loop, then eventually goes to how the war end and eventual eradiction of Judgment Day. Spanned across T4, T5 equivalents. The reason that multiple timeline being rather weak is: in original future, humanity defeats skynet under Connor in one-in-a-billion chance, that’s the whole point why Skynet would sent Terminators. Thus human victory over multi-timeline sounds simply weak.